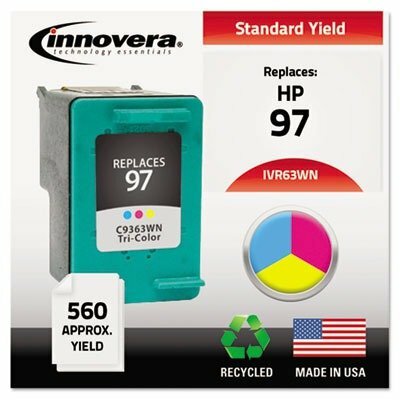 Premium, remanufactured ink cartridge is designed for use with Hewlett-Packard Deskjet 460 Series, 5740 Series, 5940 Series, 6520 Series, 6540 Series, 6620 Series, 6830v, 6840 Series, 9800 Series; Office jet H470 Series, 6200, 6210 Series, 7210 Series, 7310 Series, 7410 Series; Photosmart 1600, 1610 Series, 2350, 2355 Series, 325 Series, 335 Series, 375 Series, 385 Series, 422, 425 Series, 428 Series, 475 Series, 2610 Series, 2710 Series, 8049, 8050, 8150 Series and 8450 Series. Elite Image is ISO certified. If you have any questions about this product by Elite Image, contact us by completing and submitting the form below. If you are looking for a specif part number, please include it with your message.